Stomping out of some brush, a tortoise thinks to itself that it is a god; that the only thing that matters in the universe is its own desires. And what it desires is food. Now a rock turtle, it sees a cricket in the middle of a road. The rock turtle considers how the world views it as a ferocious, terrifying creature. As the rock turtle approaches the cricket, though, a car comes screeching to a halt, just short of running it over. With a scream, Michelangelo awakens in his bedroom, having just been roused from a terrible nightmare. Splinter enters the room and calms “Michael”, telling him that as real as it felt, what he experienced was only a nightmare. As Michelangelo goes back to sleep and Splinter exits the room, the old rat sheds a tear, having apparently known the truth about his son’s distress. *This story is something of a spiritual sequel to “Turtle Dreams” by Steve Bissette. *Despite having been drawn by Michael Zulli, “O-Deed” does not take place in his “Souls Winter” universe. Zulli even modifies his style for Michelangelo so that he appears in his more Mirage-esque design. 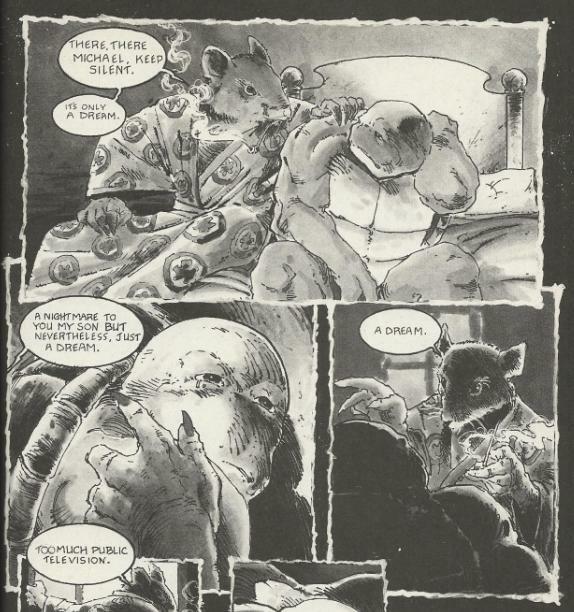 *This story was reprinted in the TMNT: Souls Winter trade paperback, published by Mirage in February, 2007. Hey, look. An issue of “Puma Blues” has escaped and disguised itself as a “Teenage Mutant Ninja Turtles” short. So naturally, they team up for a Turtle short strip that’s all about how people are destroying the earth with pollution and greed, as the unnamed human delivers a lengthy sermon about conservation, responsibility, etc. Damn, but if Murphy isn’t a broken record. What elevates this from being just another one of Murphy’s soap box sessions is the presentation. To Murphy’s credit, he gets the setting of the dreamscape to work for him and exploits the idea of a constantly changing scenario and a stream of nonsense that makes perfect sense… but only when you’re asleep. I’m sure we’ve all noticed that dreams aren’t really linear or structured. Your surroundings are always changing and you’re always changing and your thoughts are always changing, yet in the context of those fluctuating situations, it all seems to make perfect sense and you rarely question it in the dream-itself. “Organized chaos”, if you will. Murphy captures that pretty well, as Mike shifts from one breed of turtle to another. The cricket starts out as a photo-realistic insect, but becomes cartoonish and silly between panels. The human lecturing Mike imbeds his message in a stream of babble that grows steadily more coherent and violent until the dream ends. 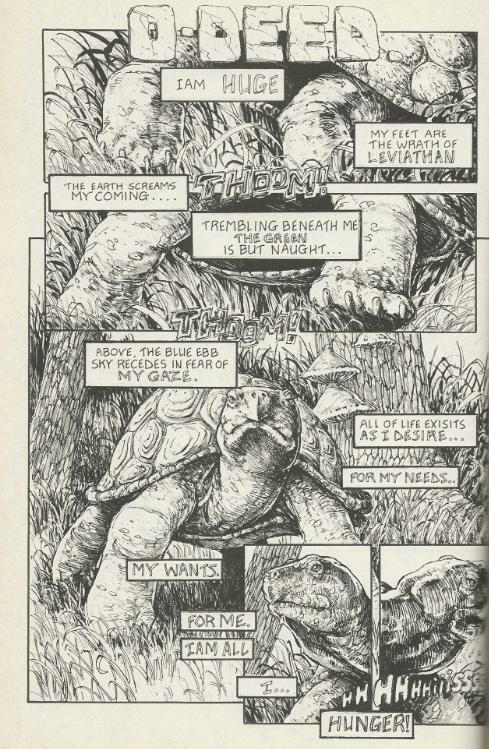 I think “O-Deed” also makes for an interesting counterpoint to “Turtle Dreams” by Steve Bissette. In that story, Michelangelo is rescued from a nightmare by Splinter. At the end of his dream, he returns to being an ordinary turtle and basks in the simplicity and safety of his natural life. Here, the set-up is much the same, but the results are far different. In this nightmare, Michelangelo is once again a “normal turtle”, but it affords him no protection from his subconscious. He learns just how small and fragile he is in the world and just how self-destructive his avarice and ego can turn out to be. 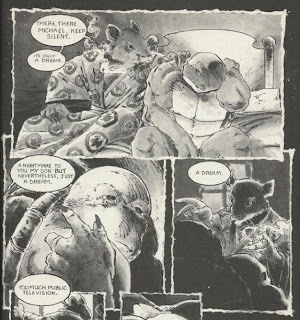 This time, Splinter can’t even really “save” him, as he knows that what Mike’s dreams are telling him are, in fact, the truth (though his crying about it sure was melodramatic). Zulli’s modified “Mirage style” for the last two pages looks good, though I’d liked to have seen him ink himself on those. Not that Talbot did a bad job, but that it would have given us a complete look at how Zulli would handle “Mirage style” Turtles. His Splinter looks mostly the same to his “Souls Winter” incarnation, though. 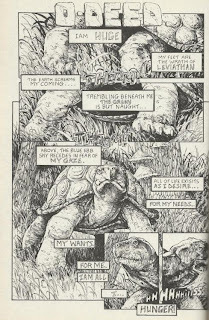 The first four pages are beautiful and Zulli captures the look of each turtle wonderfully. “Puma Blues” may have been one sermon after another, but that book sure was pretty, and such is the case with “O-Deed”. And that’s really all there is to it. At the end of the day, “O-Deed” is “just another Steve Murphy environmentalism story” and god, haven’t we read ENOUGH of those? Still, it’s one of the prettiest Steve Murphy environmentalism stories, so it’s hard to hate. Would you say Puma Blues is worth reading?